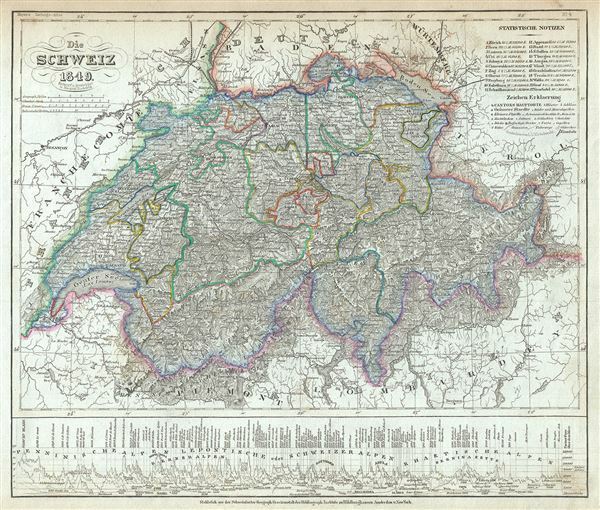 This is a fine 1849 map of Switzerland by Joseph Meyer. It covers the entire country and shows the division by Cantons from Vaud to Grisons. Also shows parts of adjacent France, Germany, and Italy. Throughout, the map identifies various cities, towns, rivers and assortment of additional topographical details. A elevation profile is included along the bottom margin of the map, and notes are included in the top right quadrant. After the ratification of a federal constitution in 1848, Switzerland underwent a rapid social and economic development. The cantonal currencies were replaced by a single currency (the Swiss Franc) and many of the cantons subsequently established representative governments and instituted freedom of the press and trade. Very good. Minor overall toning and spotting at places.